Clothing is an integral part of our lifestyle as well as personality. A dress with a perfect fit not only adds to the aesthetic value but also enhances a person’s confidence level. These days, we are more dependent on branded readymade apparels. This certainly caters us with more options and also saves time. We just need to walk into a reputed apparel store and pick up the item we like most. While it’s quite easy to find something with a perfect colour and even a likable design, it’s always difficult to find the perfect fit. Most of the times, we have to compromise or adjust with our dressing. At least for me, it has happened countless times that I wished for a better fit or have to go for an alteration after the purchase. The case with my husband is even worse. Every time he picks up a shirt or a pair of trousers of his choice, he always finds some problem with the fit. Every time we come out of an apparel store, his continuous grudge about even the most reputed brands, drives me crazy. So, one can easily imagine my eagerness and excitement to have a look at the newly launched Van Heusen MyFit collection. There are some brands, which do not need any introduction. Van Heusen is one of them. As a part of the Madura Fashion & Lifestyle Ltd, (Aditya Birla Group), Van Heusen entered India in 1990. Since then, the brand has successfully created a style of its own, a unique blend of contemporary fashion and eternal elegance. Van Heusen’s latest innovation, the MYFIT collection has unveiled an all-new world where you don’t need to compromise with your dressing. 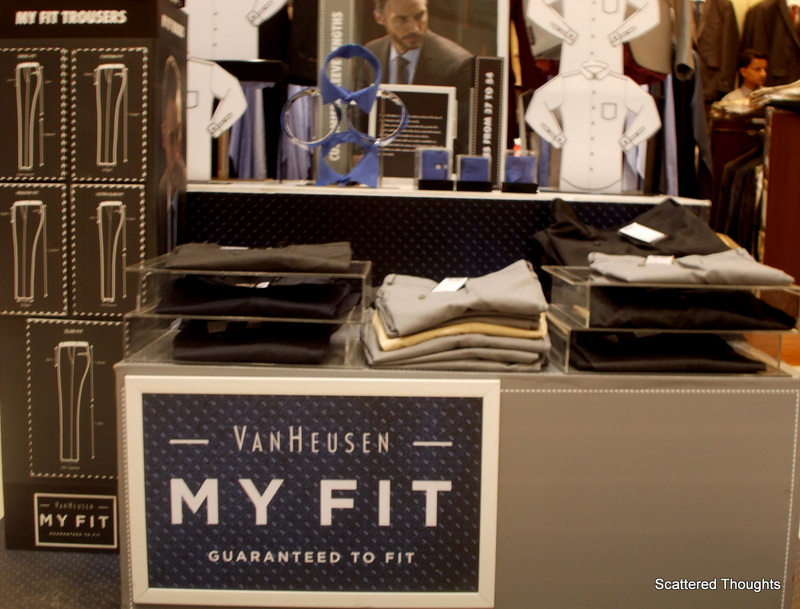 My husband and I visited the exclusive Van Heusen Store at the South City Mall, to have a look at the MyFit Range. The store manager Mr Prabir Dawan listened to our needs and explained the exclusive features of the MyFit Range. Another store personnel, Varun, assisted my husband to try on the sample (not-for-sale) shirts and trousers. He finally settled for a shirt which Varun told, belonged to the ‘Athletic Fit’ category and was perfect for him. He also helped my Mr. R to find the actual shirt and trouser sizes. Mr. R was extremely satisfied to discover that MyFit shirts come in even unusual sizes of 41 and 42.5. Next we were shown the catalogue (lookbook containing samples of fabric materials with different colours and codes) to choose the fabric type and colour. Having a plethora of options in this segment, we had a hard time to pick one from so many favourites. We finally selected a classic cotton black fabric (black being the favourite colour of both of us). Mr. R personally stylized his shirt from the given options (it was a tough time too, for the varied range of many options). I insisted on the mandarin collars, but he preferred the classic ones. I didn’t interfere much as I basically had no idea that even men’s shirts could have so many different styles and designs! After finalizing the size, fabric and styling of the shirt, Varun followed the same procedure with the trouser. 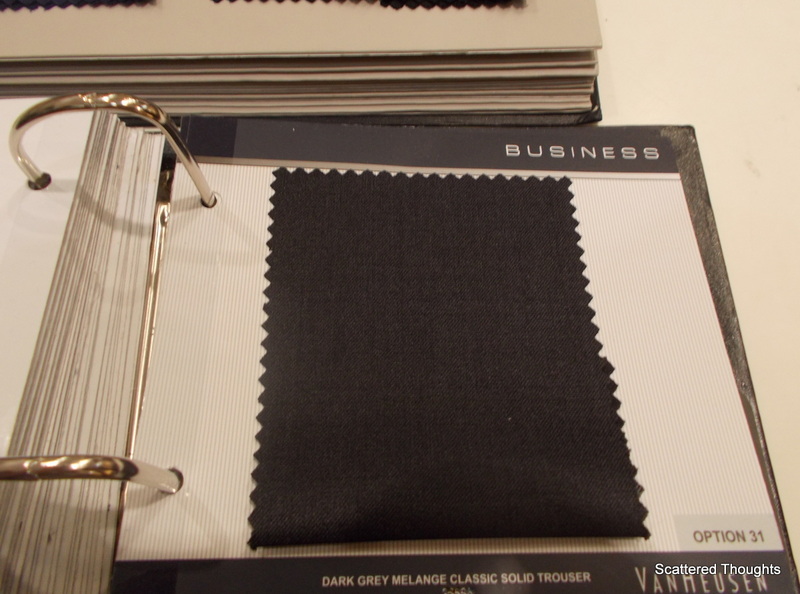 After much contemplation, Mr. R finally made his decision with a greyish-black, cotton, pleated, custom-fit trouser. Another store personnel duly noted down all the required measurements so that the items be delivered in exactly the way we wanted them to be. Mr. R looked quite happy and came out of the store with words of compliments. VH is one of those few brands which he always prefers and now after experiencing the MYFIT range, I think he will not look at anything else. The MyFit Range from Van Heusen is a solution for those who prefer perfection in dressing. Finding the right fit with the right fabric and style is a difficulty we often face. Van Heusen has created the solution to their understanding of the Indian body types and the quest for perfect fit ends here. The quality and texture of the fabric is stunning and, the price range is quite justified according to me. My husband’s preferred fabric is always cotton which best suits the Indian climate. The cotton fabric material for his MyFit shirt is superb and velvety smooth. Not only fit and style, this range also excels when it comes to comfort. Moreover, the store personnel is extremely helpful, cordial and experienced. Their assistance has really helped us and has made this shopping experience one of the happiest and most satisfying ones. And here is a picture of Mr R, the MyFit shirt fits him perfectly and he is quite contended. Experience VH MyFit Range. Reinvent yourself. Please Note- My Fit is not a customization or a made-to-measure solution, despite it has a few customizable features. My Fit helps you finding the perfectly fitted shirt and trouser. To know more visit Van Heusen MyFit. Nice post. Brings back memories of the days, when the tailor reigned supreme with a waiting period of weeks for a “trial”! please find our link and participate for week 81 next week. lovely art and story talent, keep posting. do visit your comment makers and enjoy your peers’ poetry. Especially i find hard to find fitting in shirts .